The best Nonstick Cookware is safe and will keep your garlic chicken from sticking to the bottom of the pot or pan But there are so many options for materials and metals, coatings, and pieces stainless steel, PFOA, anodized aluminum, copper, titanium, Teflon. 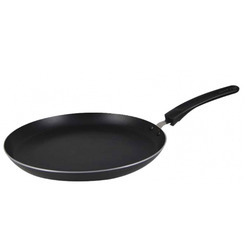 These Frying Pans offer an easier way of cooking and provide a solid handle which enables safe handling of the pan. 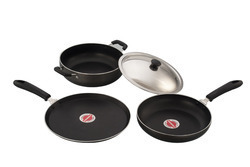 These pans are available in different sizes and capacities. These are highly durable and non-sticky.These are light in weight and have been manufactured using food grade materials. We make them available at economical prices. We provide a wide range of Non Stick Dosa Tawa which are made available in different capacities. These do not lead to any residue and comprise of non-sticky scratch proof surface. They have a uniform base, which provides uniform heat distribution and leads to lesser consumption of fuel. These tawas are in great demand in hotels, restaurants, houses and other food joints for preparing various delicacies namely dosa, upma and so on. Here is one stop solution to your cooking needs! Bring home this cookware set containing a Sauce pan, Serving bowl with lid, Kadai and Stew pot for an ultimate cooking experience. This brings to you a classic range of cookware from the house of Sowbaghya. 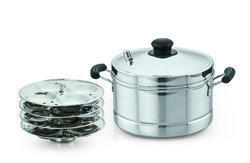 The high quality cookware made of stainless steel is sure to suit your preference. 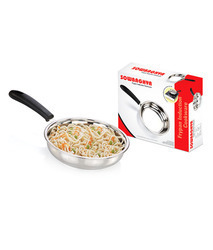 Add a touch of class to your cookware collection with this Appachatty with lid. This Appachatty is a must have addition to your cookware collection to satisfy all your kitchen needs. The high quality cookware made of aluminium with non-stick coating is sure to suit your preference. Note: Works only in Gas Stoves. · Requires Less cooking oil. · For clean and healthy cooking. 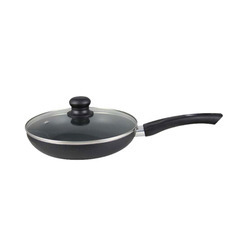 Add a touch of class to your cookware collection with this dosa tawa, frypan and Kadai with Lid. This 3 Pcs Set is a must have addition to your cookware collection to satisfy all your kitchen needs. This brings to you a classic range of cookware from the house of Sowbaghya. The high quality cookware made of aluminium with non-stick coating is sure to suit your preference. Add a touch of class to your cookware collection with this dosa tawa. This tawa is a must have addition to your cookware collection. Sowbaghya brings to you a classic range of cookware from the house . The high quality cookware made of aluminium with non-stick coating is sure to suit your preference. Has three layer non stick coating. 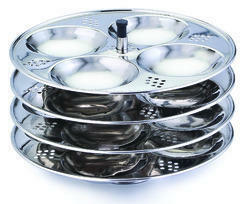 Make your cooking experience even more special with this Idly plates. This idly plate is suitable in Sowbaghya 5ltrs and 7.5Ltrs Pressure Cookers to make soft idlies within few minutes. 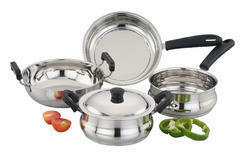 The high quality cookware made of stainless steel is sure to suit your preference. 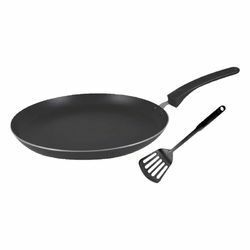 Looking for Non-Stick Cookware ?